iMacsoft DVD to iPhone Converter, an excellent DVD to iPhone converter, can rip and convert DVD movies including DVD movie and IFO image files to iPhone video and audio files. And the output files can be played well on your iPhone 3, iPhone 4, iPhone 5, iPhone 5S/5C, iPhone 6/6 Plus, iPod classic, iPod shuffle, iPod shuffle 6G, iPod nano, iPod nano 5G, iPod nano 6G, iPod touch, iPod touch 4, iPad, iPad 2, the new iPad, iPad mini, iPad 4, and other multimedia players. iMacsoft DVD to iPhone Converter can fast rip and convert DVDs to iPhone MPEG-4, h.264/MPEG-4 AVC, MOV video formats with the latest H.264 video encoding technology. This best DVD to iPhone Converter can also rip and convert DVDs to iPhone MP3, M4A, AAC and WAV audio formats. iMacsoft DVD to iPhone Converter presets multiple MPEG-4 movies at different resolutions for iPhone 3, iPhone 4, iPhone 5, iPhone 5S/5C, iPhone 6/6 Plus. To get better playing effect, you can choose subtitle, audio track and aspect and set video and audio bitrate and frame rate for target iPhone movie. 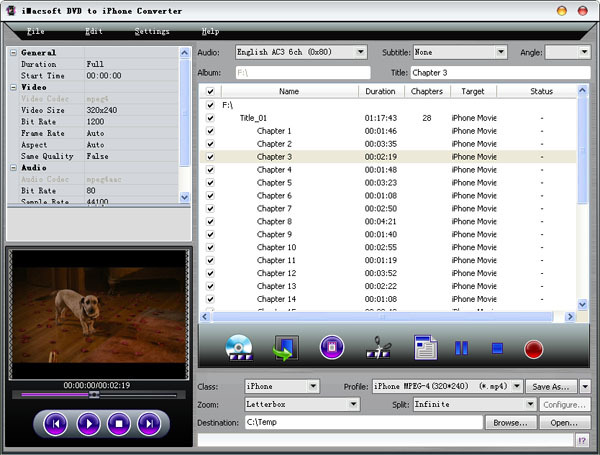 Choosing movie segment and splitting large file are available in this DVD to iPhone converter software. With iMacsoft DVD to iPhone Converter, just a few clicks are enough, you can share your favorite DVD movies on iPhone 3, iPhone 4, iPhone 5, iPhone 5S/5C, iPhone 6/6 Plus. How to convert DVD to iPhone 4S? How to convert DVD to iPhone MP4 video files? How to rip movie DVD to iPhone MP3 files? How to rip DVD to AVI video files? How to convert IFO files to iPhone 4G? How to customize your own iPhone video and audio?